I have run three stories in Jukebox Collector Magazine about Anthony Ballato (the Jukebox Counsellor) and his jukebox collecting over the past 11 years, starting with our December 1997 issue. Anthony’s interest in jukeboxes started as the result of what he saw when he got his 1986 Sharper Image catalog. On the cover was an Antique Apparatus Gazelle (W950) jukebox with an airbrushed created image of Marilyn Monroe cozylng up to the jukebox. As fate would have it, Sharper Image closed recently and Bruce Toledo (owner of ItsOnSale, Inc.) purchased some artwork and collectables from the owner’s office. 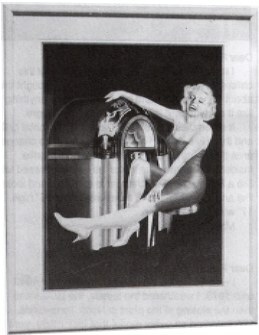 After doing some research online, Bruce came upon the article from Jukebox Collector’s December 1997 issue on Ballato’s website www.LI-LAW.NET and called Anthony to tell him what he had found – the original airbrush rendering of Marilyn Monroe that was used on the cover of the 1986 Sharper Image Catalog. 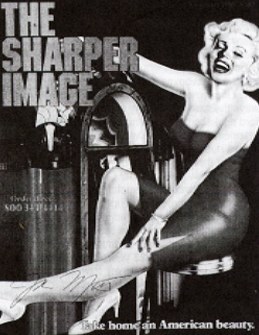 I learned the Sharper Image went “bankrupt” when I went to the local retail store on Davis Street in San Francisco and saw everything marked down by at least 5.0% (early August, 2008). I was invited upstairs to the “home offices” above the retail store by the liquidator in charge of disposing the assets to bid on some of the original art work that was hanging on the walls throughout the offices. I was amazed by some of the original art they have accumulated through the years. The offices had a museum like feeling to them rather than office space. I was like a kid in the candy store. The very first office I went into was the former CEO’s of Sharper Image “Richard Thalmheimer”. His office was as large or larger than the size of my million dollar condo in downtown San Francisco. The views of the Bay Bridge & Fisherman’s Wharf were breath taking. The very first painting my eyes gravitated to was the original painting by John Mattos’ of “Marilyn with her arms wrapped around an Antique Apparatus Juke Box”. (John is a famous Illustrator with more than 30 years in the business). It was obvious that this was an original painting and shortly after I learned it was created for a 1986 cover of Sharper Image. (One of the most successful covers ever) I quickly negotiated a price for the piece, through it and a handful of other original art in my car & went home to Google the Artist. I was amazed to learn that the artist John Mattos had an office in China Town no more than 10 minutes from my house. I called him, shared the story of how I obtained the piece & shortly after he invited me to his studio so he could “reacquaint himself with an old friend. To my amazement, an article written about Anthony Ballato more than 10 years ago came up. I learned Anthony is a very well respected NY Attorney who is also a legendary Juke Box collector. I went on to read that the painting I now own was one of the “spark plugs” that got Anthony so excited about collecting Juke Boxes more than 20 years ago. It’s a well written famous article that appeared in a Juke Box collecting magazine. At that point I knew I had something very special & meaningful. After doing more research, I learned that this painting was one of the most successful covers ever in Sharper’ Image history. They sold more items as a result of this painting than any other covers 10 follow in more than 20 plus years.